Allan Egbert, of Sidney, drops his ballot into the Police team box after donating blood during the Heroes Behind the Badge Blood Drive in Sidney recently. 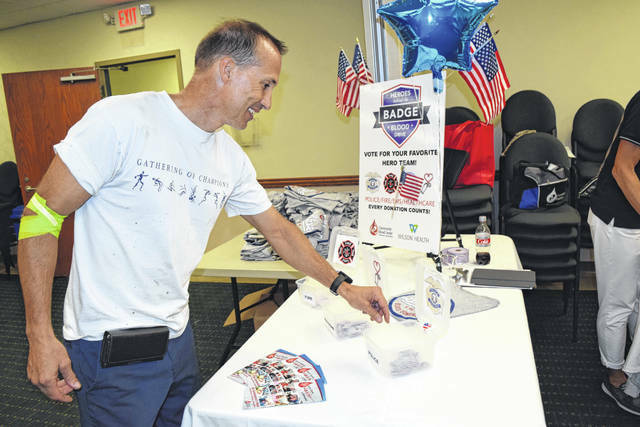 SIDNEY — The purple ballots were piling up fast in the “Healthcare” box at the third annual “Heroes Behind the Badge Blood Drive” Aug. 28 at Wilson Health and “Healthcare” supporters could sense another victory in their friendly rivalry with the Police and Fire teams. “We ARE Healthcare!” said Kendra Frazier as she voted with fellow Wilson Health staff members. “Because we rock, Healthcare rocks!” agreed Heather Kean. Healthcare dominated the blood drive challenge with 37 donor votes while Police and Fire tied for second place with 23 votes each. The outcome was a repeat of last year, when Healthcare won and Police and Fire also finished in a second-place tie. The “Heroes” challenge was another victory for hospital patients who depend on Community Blood Center donors. The blood drive totaled 88 donors, including 11 first-time donors and 71 donations. Community donors again faced tough decisions when voting for their favorite public safety team. Sidney donor Kevin Starrett voted for Police. “I know a lot of them and they give me support at my job,” he said. Asked about his vote, Tom Fitchpatrick said, “Just look at my arm.” Fitchpatrick is a volunteer firefighter with the Port Jefferson Community Fire Company. On the right shoulder of his donation arm is a tattoo of a skull in a fire helmet, his badge number and “Oct. 6, 1985,” the date he joined the fire company. “I’m always on call for fire,” said Fitchpatrick.